Schatz Energy Research Center at Humboldt State University. Hydrogen is not a source of energy, merely a way to store energy. 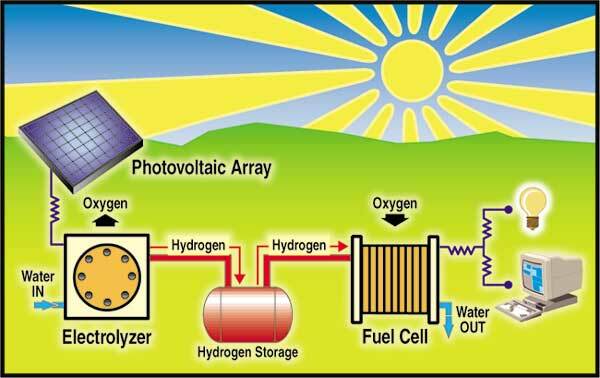 It is difficult to find anyone familiar with solar electricity who seriously thinks that we are going to replicate our current misbehaviors with fossil fuels by switching to solar hydrogen. While it is unlikely that a solar - hydrogen economy will ever be created that replicates our current destructive, over consumptive lifestyles (at least the minority of humanity that lives in the US, Europe and Japan), it would be useful toward sustaining a much more modest, local production civilization based on current solar income. A small amount of solar electricity in so-called third world villages would do wonders to improve the standard of living, education, communication, water pumping and purification, etc. (The cost of the invasion of the Iraqi oil fields is roughly what it would cost to provide clean water for most of the rural villages in the "Third World.") And we here in the so-called First World could learn to live more efficiently as we shift the electric grids toward 100% renewable energy, seeking greater satisfaction in cultivating human relationships, culture and bioregional visions as the oil winds down and mandates a more local way of life. PORTLAND, Ore. — Researchers at the Massachusetts Institute of Technology have combined a liquid catalyst with photovoltaic cells to achieve what they claim is a solar energy system that could generate electricity around the clock. Nickel oxide catalysts are currently used to boost the efficiency of electrolyzers, and they worked equally well in MIT's formulation, Nocera acknowledged. He added that the toxicity of nickel oxide forces the use of expensive, hermetically-sealed water containers. MIT's patented catalyst formulation is "green," Nocera said, and can be used in inexpensive open containers. "Nickel oxide can't be used around anything else in the environment because of corrosion -- even the carbon dioxide in the air will react with it to make carbonates," said Nocera. "But our catalyst uses abundant materials that don't react with environment." MIT's patented formulation of cobalt phosphate was dissolved in water. When the electrical current is passed through it to initiate electrolysis, the catalyst attached itself to the oxygen electrode to increase its efficiency. When the electrical current was turned off, the cobalt phosphate dissolved back into water. The simplicity of the process enables basic electrolyzers to be used, the researchers said. "Because our catalyst is green, the machines that perform electrolysis can be much less expensive than they are today, since they don't need to be protected from environmental contaminants," said Nocera. Currently, MIT is working with photovoltaic cell manufacturers to incorporate electrolysis using their catalyst into solar energy systems. By combining the two, excess capacity during the day could be stored as hydrogen and oxygen, then used in fuel cells at night when needed. "Solar cell makers can add super-cheap electrolyzers to their system so that they work 24/7 -- during the day making hydrogen and oxygen, then at night recombining it in fuel cells to generate electricity," Nocera predicted. Matthew Kanan, a MIT postdoctoral fellow, assisted in the research. Funding was provided by the MIT Energy Initiative, the Chesonis Family Foundation, the Solar Revolution Project and the National Science Foundation.